The elation over the major market indices approaching new highs is being replaced by market fatigue. At least that’s the way it appears on the charts. 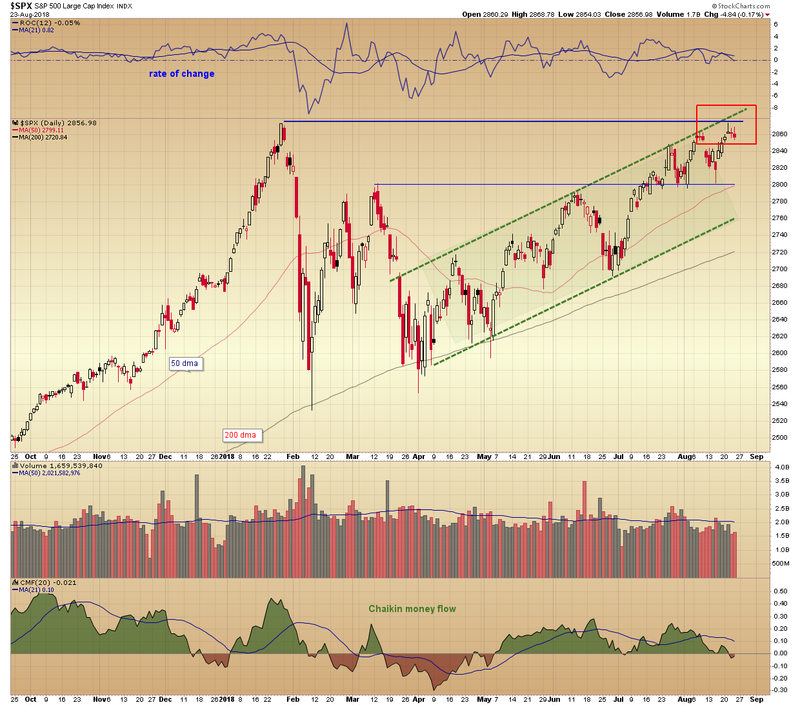 Take a look at the S&P 500 Index daily chart. We have noted for some time here and on Twitter, that the new high level at 2873 is also an intersection of technical resistance. As the index has advanced closer to this alliance of resistance, overall daily range has diminished and more recently a series of high wick candles have formed. High wick candles reflect an inability to hold higher price levels. Their importance increases when there are several in a row and they form at important levels of resistance. Additionally, the rate of change indicator, a reflection of pure momentum, is moving in bearish divergence to price and is crossing below its center line. Negative readings reflect price declines. Also, Chaikin money flow has moved into negative territory. This is an early suggestion of distribution not accumulation. Overall volume continues to remain a problem for the broad market, as it has for some time. These developments suggest buyer fatigue. Likely, there are simply no new buyers left to propel the S&P higher. 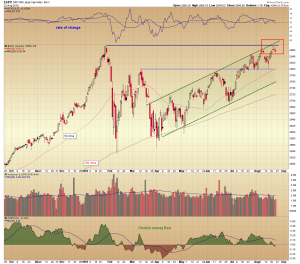 There could also be some early stage selling, as existing holders are losing confidence in the ability of the index to break through multiple layers of resistance and sustain a breakout.